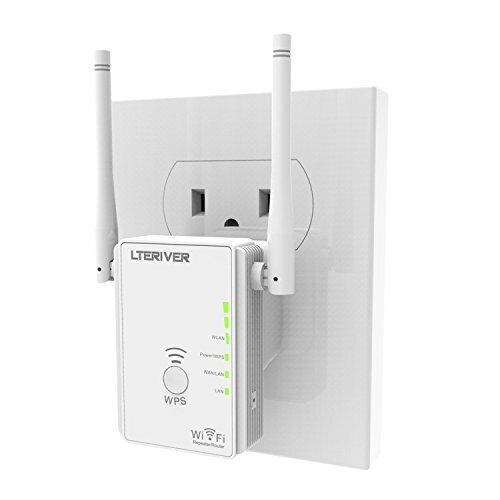 TheLTERIVER E300 300Mbps WiFi AP/Router/Repeater supports 802.11 N wireless transmission standards,and compatible with IEEE802.11 b/g standards,supports data rate up to 300 Mbps. 1.Supports Wi-Fi Repeater/ Wireless AP/ Wireless Router with three mode,satisfy different using requirements. 2.Wireless N 300Mbps high speed ensure better Wi-Fi gaming, video&audio better transmission. 3.Very easy to set up by wireless device like smart phone( Iphone,Samsung ,LG,Black Barry etc),IPAD,Android Pad,Windows Pad, Note book ,Desktop PC etc. 4.Two external 3dbi Wi-Fi antenna provide better Wi-Fi performance. 5.Rotatable Wi-Fi antenna design can choose better connect direction for your poor Wi-Fi area. 6.With powerful control button, easy energy saving&Wi-Fi Control. 7.Updated firmware easy web set up Wi-Fi Repeater mode(6 steps),Router mode(4 steps),AP mode(2 steps). 8.Compatible most of Wireless Router brand such as Cisco,TP-LINK,APPLE Airport,Netgear,Linksys,D-link,ASUS,Secrifi,Belkin,etc. Repeater Mode:Extend Wi-Fi coverage, Eliminate Wi-Fi Dead Zones. AP Mode:Provide high performance free Wi-Fi connection by Ethernet cable from your existing wireless router or switch. Router Mode:Provide high performance free Wi-Fi connection by internet cable from the ethernet modem. If you have any questions about this product by LTERIVER, contact us by completing and submitting the form below. If you are looking for a specif part number, please include it with your message.